Below you’ll find the link for a new 5 minute master class on testing your range. To know how the high and low notes of both your head and chest voices – is valuable information for any singer. It can guide you in song choices, proper key changes, as well as a better understanding of your voice’s nuance, strengths and weaknesses. This all leads to more accurate problem solving in the case you are having trouble with a particular note, or sequence – and puts you on the road to mastery. There are really so many ways to map out your range, and it’s not an exact science. But the exercise I’ve outlined is a simple method that most should find accessible. I’m going to introduce some more complicated vocal exercises soon, that can be used for the same purpose. Remember, it’s not something that you will do just once. It’s something you will want to do many times, with different parameters, such as time of day, different exercises, ect. Overtime, you’ll build a pretty accurate map of your voice’s landscape. If you have not already tested your voice, I would recommend you do this soon. Then over the months, years of practice - you can use this exercise as the constant. You can use this as a yardstick of comparision for your own voice to your own voice. Over time, you can see what areas have grown stronger, what notes have become easier, ect. You can also use this to see how allergies, fatigue, and other daily factors can affect it. For example, when I get a cold, my low voice comes in so nice, with all kinds of deep tones, but my head voice disappears. For those who are just now starting to sing at the same time as they play, and particularly if you are finding it overwhelming; this is great exercise to just that. You can start to foster a connection of voice to the keys, work on that joint skill of singing and playing at the same time + learn more about your range in the process. If you are unsure of how your head or chest voice works, or unable to control which one you use, no problem. There will be more to come on those topics in the future. For now, just let your voice do what’s natural and concentrate on matching pitch. The rest will come in time. Being aware is the first step. It’s a huge misconception that the bigger the range, the better the singer. Some people are blessed with 5 octave range but this is rare and still takes hard work to develop the full range. 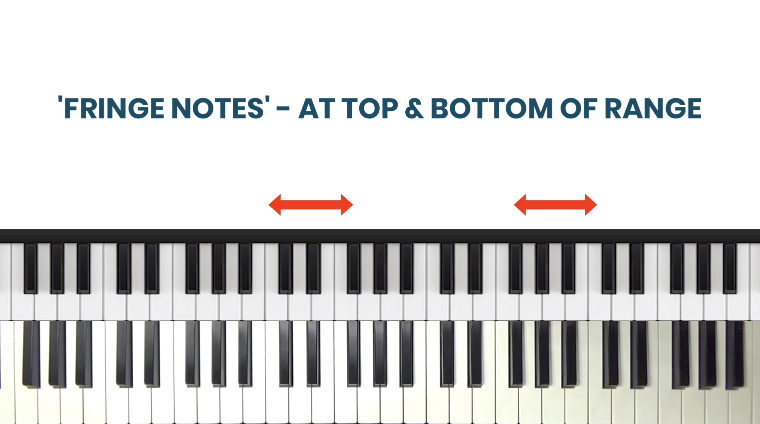 Most people have 2-3 octaves. The truth is, it’s not how big their range, but what they do with the notes they have that counts. How much control, tone, color, emotion can they convey? So whatever your range tests to be today remember – it does not define you. 1 - It can and does change, especially when actively working through vocal exercises, ect. 2 –The knowledge you gain about your voice can serve to make you a better singer of the notes you do have. In this 5-minute masterclass, we will walk thought a number of vocal exercises that can help you gain valuable information about your voice.